Jean Luc-Godard’s first feature, Breathless (A Bout de Souffle, 1960), was not the first French New Wave (Nouvelle Vague) film, but it soon became its signature work. Made on a low budget and shot entirely on the street and in urban locations, the film proved to be a box-office sensation and had over two million admissions in France alone. 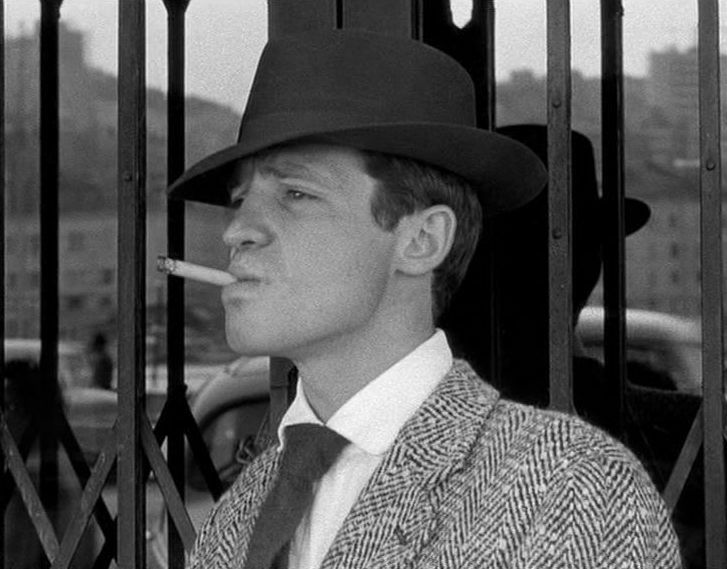 Not only that, it made the New Wave an international brand and catapulted Godard and others associated with the film’s production, such as Raoul Coutard and Jean-Paul Belmondo, to worldwide stardom. 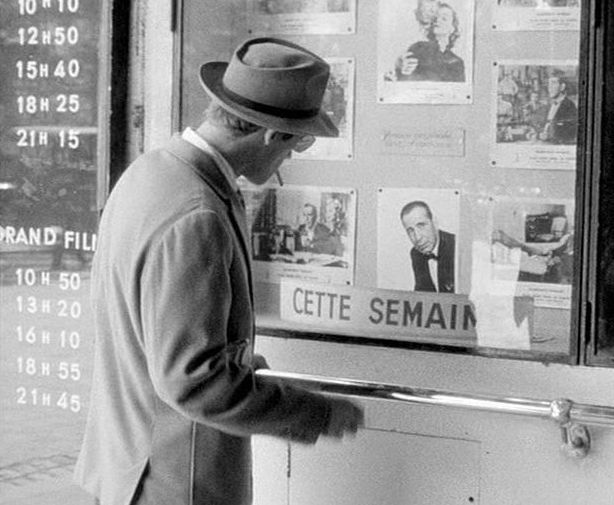 Of all those Cahiers du Cinema critics, Godard was probably the most argumentative and uncompromising, so it is perhaps not surprising that his film stood out and was even more distinctive than those of his colleagues. 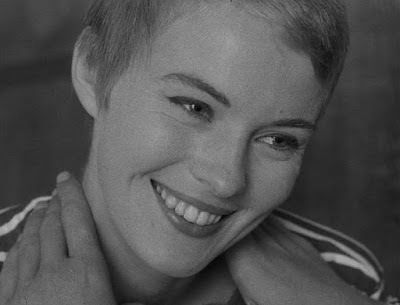 Thus Breathless is often seen today as a historical landmark that affected the course of cinematic expression. Nevertheless, the film is not just of historical interest, in the fashion, say, of The Birth of a Nation (1915), but still has an electric vitality when viewed today . Although the New Wave critics were avowed auteurists, I believe that the success of Breathless is not solely due to Godard’s undoubted abilities. There was a fortunate concurrence of disparate talents that helped make the film the masterpiece that it is [3,4,5]. For one thing, there were contributions from his Cahiers du Cinema colleagues. Claude Chabrol, who had already had success with two features, served as a technical advisor for the film. In addition the original story and treatment came from Francois Truffaut, who was then a good friend of Godard’s and was fresh off the success of his own debut film, The 400 Blows (1959). Truffaut’s scheme told the noirish story of a young criminal’s desperate efforts to avoid police pursuing him and gather up his girlfriend in Paris so that the two of them can make a getaway to Rome. This treatment provided Godard with a basic narrative structure for the film – which was not the kind of thing, it seems, that naturally emerged from his own inspiration and was not so apparent in his subsequent films. Also noteworthy, and crucial to the film’s dramatic impact on audiences, was its gaudy cinematography. The first thing that stands out is the proliferation of jump cuts – jolting cuts without changing the frame – that would normally be regarded as film-editing faults in other contexts. Here, however, the jump cuts work to positive effect, and help give the film a sense of a hectic, out-of-control haste that is constantly jumping the story forward. This is presumably what is alluded to by the film’s French title, “A Bout de Souffle”, which literally in English means: “Out of Breath” and which would probably have been a better English title for the film. Further accentuating the nervousness created by the jump-cuts were opposing moments of slowed-down pace due to long-duration tracking shots of conversations mostly between the two main characters. These slow-moving passages in the middle of hectic circumstances with the clock ticking made for a maddening stop-and-go tempo that makes the viewer even more mindful of the criminal’s dire situation. 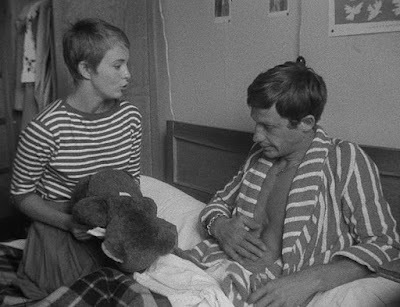 Now you might say that this back-and-forth temporal movement between skittishness and languor represented a brilliant piece of mise en scene on Godard’s part; but I wonder if perhaps this ingenious effect was actually an accident of Godard’s somewhat ad hoc production circumstances. Although Godard was writing the script each day as the film was being shot, the shooting was carefully planned and all the dialogue was pre-specified and not extemporaneously created. In fact the film was shot without sound, and all the pre-specified dialogue was dubbed in later. 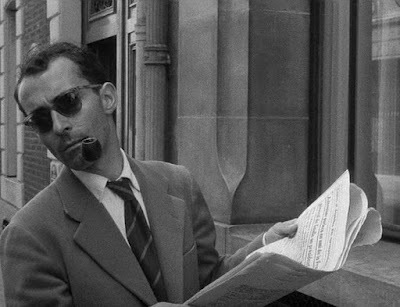 Godard was fortunate to have hooked up with the resourceful young cinematographer, Raoul Coutard, who came up with practical ways to photograph Godard’s scenes in crowded locations. Now while it is known that Coutard made innovative use of hand-held photography (not common in those days with the relatively heavy equipment in use), this does not mean that Godard and Coutard were winging it as they proceeded filming the script. In fact the moving camera shots appear to have been carefully planned, with some of them lasting as long as three minutes. These moving camera shots appear when the two main characters are engaged in key conversations. However, during the final editing stages of the film, as Roger Ebert has pointed out, Godard discovered that the film was 30 minutes too long and needed to be shortened . 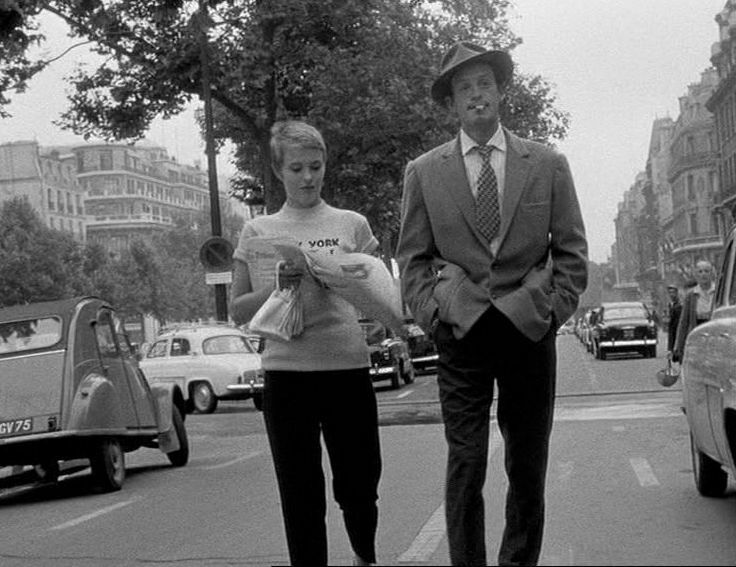 Godard couldn’t go ahead and cut up the lengthy moving-camera shots – they needed to be retained intact. And he didn’t want to remove the dialogue that he had written. So he was left with cutting a lot of the film’s transitions, creating all those jump cuts. If Ebert is correct, then we are led to believe that the film’s nervous back-and-forth tempo was something of an accidental creation. However, we shouldn’t let Breathless’s innovative cinematography, whether accidental or planned, dominate our perspective on the film. The really fascinating thing about this work is not so much the cinematography but more the edgy and winding romantic relationship of the two main characters. 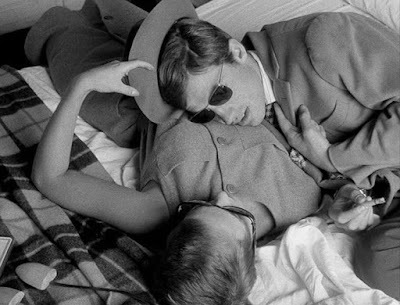 Breathless was not the first film depicting the always fascinating situation of a romantic young couple on the run from the law, but it may have been the most inspired. Its predecessors in this camp include Nicholas Ray’s They Live by Night (1948) and Joseph H. Lewis’s Gun Crazy (1950). And we can see strong traces of Breathless in Arthur Penn’s Bonnie and Clyde (1966), Terrence Malick’s Badlands (1973), Steven Spielberg’s The Sugarland Express (1974), and Robert Altman’s Thieves Like Us (1974) . In all these films there is a sense of fatalism and romantic desperation. One of the two romantic characters in these narratives is totally reckless, with the partner helplessly following along and unable to prevent their ultimate destruction. 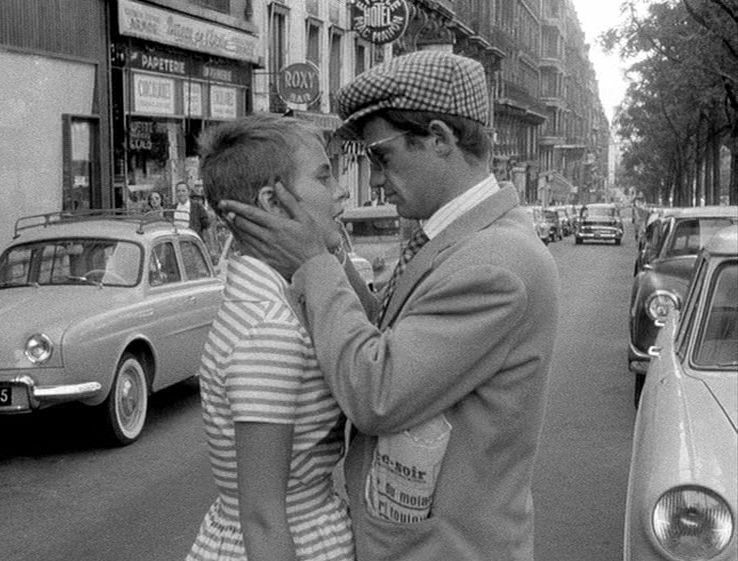 In Breathless the romantic couple is played by Jean-Paul Belmondo (in the role of Michel Poiccard) and Jean Seberg (as Patricia Franchini), and the personae of these two actors very much dominates the film’s presentation. 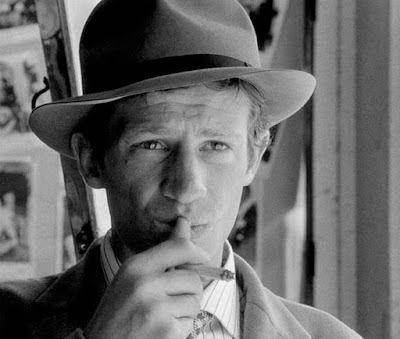 Belmondo was 26 years old at the time, and his expressive face and sinewy physique gave a kinetic and emotional image to his character. Seberg was only 21, but already a Hollywood star. Her cool beauty and impenetrable innocence provided the perfect foil for Belmondo’s romantic shadow boxing. 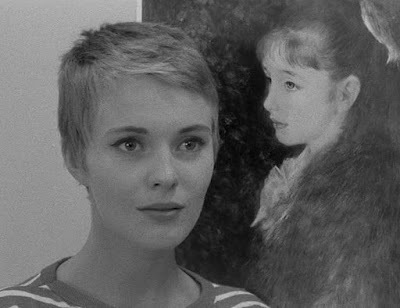 One of the film’s strong points is the way Godard visually dwells at length and in repeated closeups on Seberg’s paradoxical allure. In fact it is worth discussing their two characters a little further. He is perpetually rehearsing small narratives that he imagines to be glamorous decorations to his character. In this connection he likes to mug and make outlandishly emotional facial expressions, in the fashion of how a teenager might make faces while looking at his or her image in the mirror. As part of his attempts at self-glorification, he admires film noir and the screen personality of Humphrey Bogart, as well as gaudy, gas-guzzling American sedans. His daredevil self image leads him to hot-wire and steal cars whenever he needs some transportation. This recklessness makes him attractive to girls but is also fatally self-destructive. Despite his adolescent and self-indulgent behaviour, though, Michel has the capacity to feel love and jealousy. His braggadocio posturing is a cover for his personal insecurity, and he cannot help revealing his emotional vulnerability. “I stayed with you to see if I was in love with you. . . . The story of Breathless proceeds through three main stages. In the first sequence the viewer is introduced to Michel Poiccard, a low-level hoodlum in Marseilles who hot-wires a parked Oldsmobile and heads north. 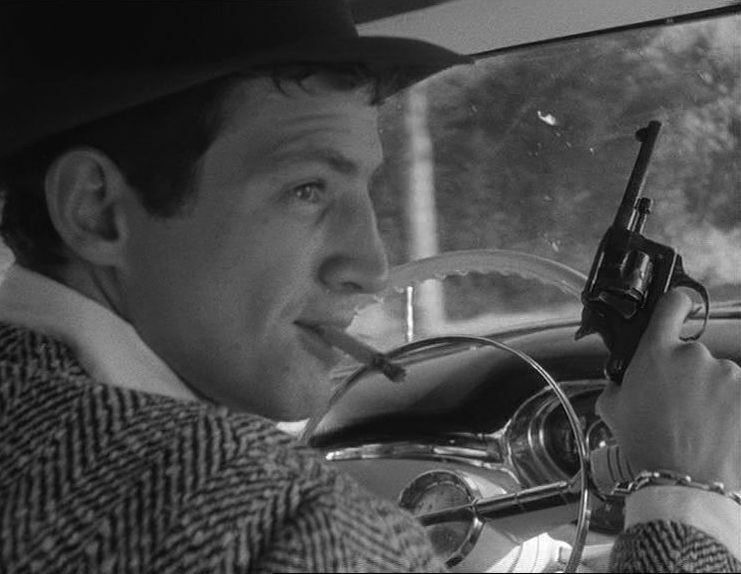 On the way driving while toying with his pistol, he talks to himself about his plans to head for Paris and pick up some money owed to him by someone, and then convince a girl, Patricia, to run away with him to Rome. Along the way some highway cops start chasing him for speeding, and Michel shoots and kills one of them when he is approached. This is all told visually with jump-cuts and at breakneck speed. Upon arriving in Paris, Michel first steals some money from a casual girlfriend. Then he tracks down Patricia, who is hawking the International Herald Tribune along the Champs Elysees, and as they talk, the pace dramatically slows down. There is a long 3:20 tracking shot of the two of them talking, as Michel tries to convince Patricia to run away to Italy with him. It seems that they had recently had a brief affair in Nice and slept together for a few nights. Patricia clearly finds Michel to be cute, but she is noncommital. Things speed up again as Michel attends to the matter of picking up some money owed to him by a person named Berruti. While moving about the city, he also notices a newspaper headline reporting that the road cop-killer has been identified as Michel Poiccard. Patricia goes back to her hotel room and discovers that Michel had stolen her room key at the front desk and is waiting for her in the room. Now the pace slows down again. This is a 23-minute scene in the small hotel room, which despite the cramped dimensions, features a series of long tracking shots – one of them a 3:20 shot of the two of them talking on the bed. Most of this scene is small talk, but it importantly reveals the evolving relationship and the disparate personalities of Michel and Patricia. At one point she mentions that grief is better than nothingness (i.e. death), and he responds by saying that he would choose nothingness: “I want it all or nothing”. They make love that night, and the next morning attend to their respective obligations – he has to get his owed money, and she needs to conduct an interview for a journal she sometimes works for. 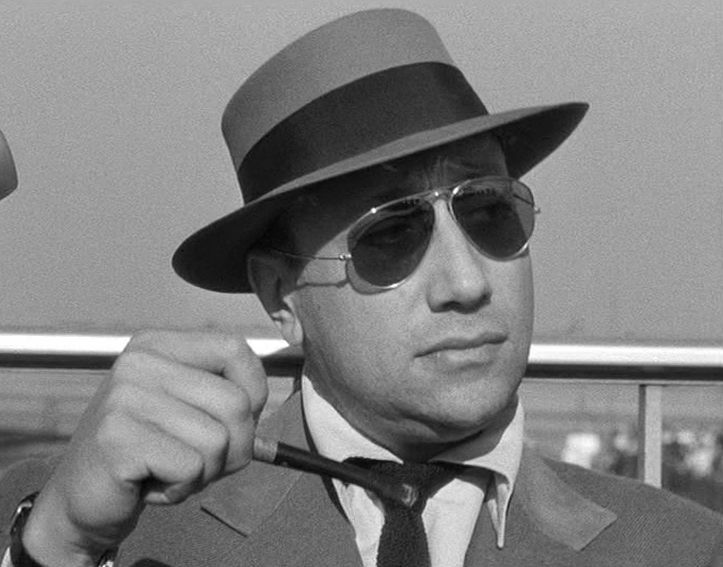 Patricia’s immediate assignment is to attend a press conference held for a trendy novelist, Parvulesco (played by noted film director Jean-Pierre Melville). This interview scene serves as something of an intermezzo in the film and gives Godard the chance to offer up some of his provocative bon mots about the world through the mouth of the novelist. While Patricia offers up some sensible queries, the other interviewers only want to ask the novelist titillating questions about how men and women posture towards each other. Parvulesco pontificates that men want only women, and women want only money. When Patricia asks him what is his greatest ambition, he answers that it is "to become immortal and then die". They eventually find Berruti for Michel’s money, but the cops are closing in. All the way along, Patricia has been agonizing over whether she really loves Michel or not. The closing sequences provide for an answer to that question. Of the comparable lovers-on-the-lam films, perhaps the closest match to Breathless is Bonnie and Clyde. 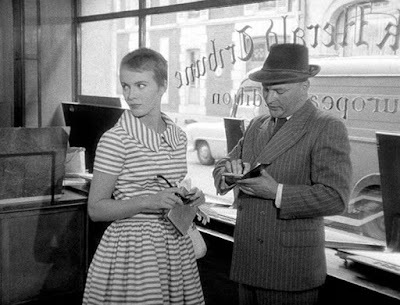 This is not too surprising, since Bonnie and Clyde's script writers, David Newman and Robert Benton, were fans of Breathless and even approached Godard about directing their script. And we can see definite traces of Michel Poiccard’s (Jean-Paul Belmondo’s) boastful vulnerability in Clyde Barrow’s (Warren Beatty’s) personality in Bonnie and Clyde. But I think an even closer overall character match might be with the Kit and Holly characters of Badlands. In that latter film, Holly is closer to Patricia’s personality than Bonnie is. Many people have been attracted to Breathless’s hip references to American culture and general self-parody. They see the film as Godard’s taking the opportunity to call attention to how media inordinately shapes modern culture and its increasing tendency towards cliche and vicarious disengagement. In addition to cultural references, there are celebrity cameo appearances. Besides the already-mentioned participation of film director Jean-Pierre Melville, there were several other figures in the cast from general French New Wave circles, including Philippe de Broca, Jacques Rivette, Jean Douchet (a Cahiers du Cinema film critic), and Jean-Luc Godard, himself, who briefly appears as a pedestrian that fingers Michel to the police. "I have contempt for it [the cinema]. It is nothing. It does not exist. Thus I love it. I love it yet at the same time I have contempt for it." Godard was vigorously opposed to the traditional conventions of studio-based narrative films. Over the following few years Godard made a succession of films that displayed a progressive retreat from cinematic narrative and looked more like cinematic essays concerning a theme, an aesthetic evolution that he explicitly embraced in an interview during that period . In fact after the 1968 political events in France, his movement from dramatic narrative to visual political tracts became even more pronounced. However, this evident retreat from narrative (in general) may have been an effect of a more specific, but deeper, underlying cause: the fact that Godard was clearly a frustrated romantic. In most of Godard’s movies, starting already with Breathless, there is a depiction of the romantic narrative being crushed by an unfeeling world ruled by capricious, uncontrollable forces. Of course some cynical hedonists might well be perfectly happy with that state of affairs. Why subject yourself to the fantasy-laden constraints of selfless love?, they might ask – just seize whatever pleasures may be at hand. But Godard is not one of these types. He is clearly frustrated, and he forcefully expresses his frustration, it seems to me, over the fact that the romantic narrative is ultimately false – it is only short-lived and inevitably doomed to fail. He tells us this over and over in his films. In this regard of romantic narrative, it is interesting to compare Godard with filmmaker Wong Kar Wai, who also depicted the sadness of failed, unattained romance. Wong, the Master of the Broken Heart, often presented impassioned yearning for romantic fulfilment and the pain that comes from unrequited love. But Wong clearly believes in love, indeed he celebrates it with his visual poetics. He simply shows the inconsolable anguish that comes from the beloved’s being unattainable. Godard, on the other hand and unlike Wong, had lost his belief in the possibility of love, and he expressed his unhappiness about it. He did this best in Breathless. John Powers, Breathless, The Criterion Collection, (8 July 1992). Phillip French, Breathless Continues to Shock and Surprise 50 Years On, The Guardian, (6 June 2010). Diane Christian and Bruce Jackson (eds. ), Conversations About Great Films: Breathless, Goldenrod Handouts, Buffalo Film Seminars, The Center for Studies in American Culture, State University of New York, Buffalo, NY (26 February 2002). Jean-Luc Godard, “Interview with Jean-Luc Godard”, Cahiers du Cinema 138, (December 1962), reprinted in Godard on Godard, Tom Milne (ed., trans. ), The Viking Press, New York, 1972, pp. 171-196. Dudley Andrew, “Breathless Then and Now”, The Criterion Collection, (28 February 2014). Roger Ebert, “Breathless”, Roger Ebert.com, (20 July 2003). Interestingly, most of these directors were relatively youthful when these films were made, and one could argue that these examples represented the respective high points of these directors’ careers.